The 2018 People’s Choice Awards were full of celebrities, from the Keeping Up With The Kardashians gang to the Vanderpump Rules crew, from Chrissy Teigen to Blake Shelton. Click through the gallery to see all the best looks and to find out who won! 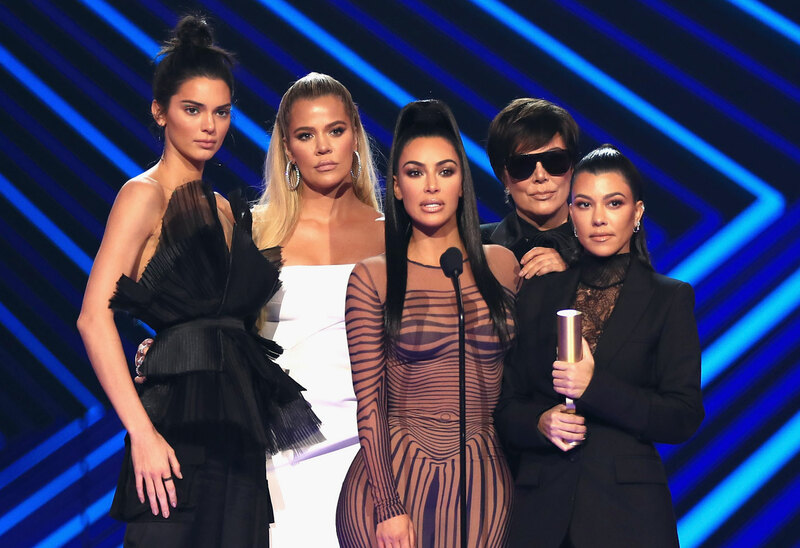 KUWTK took home the Reality Show of 2018 award. Kim, Kourtney, and Khloe Kardashian and Kris and Kendall Jenner were on hand to accept the gold tubes. They famous family enjoyed their night out, despite the California wildfires threatening their homes. Their friend Chrissy looked stunning in a sparkly minidress. One of the shows KUWTK beat for the reality award was Bravo's Vanderpump Rules. Katie Maloney and Tom Schwartz looked adorable and in love on the red carpet. Jax Taylor and Brittany Cartwright cozied up for the cameras. Their June engagement will feature on season seven of VPR, which premieres this December. Their cast mate Lala Kent got engaged at the end of the summer, but she walked the red carpet without her man. Stassi Schroeder wowed in a black mini dress. Scheana Marie rocked a shiny red jumpsuit. Kristen Doute also opted for a jumpsuit. Tom Sandoval looked sharp in his tux while girlfriend Ariana Madix looked awesome in a patterned suit. Kylie Jenner's ex Tyga performed. He wore a heavy black leather coat. Victoria Beckham rocked a white suit as she accepted her Fashion Icon award. She even referenced the Spice Girls in her acceptance speech. Blake won the award for favorite country artist. He pulled his girlfriend Gwen Stefani on stage with him. Jersey Shore star Jenni "JWOWW" Farley went for full Hollywood glamour. Her cast mate Angelina Pivarnick chose a black, lacy look. Mila Kunis kept things simple in a little black dress. Scarlett Johansson opted for black high-waisted pants with a red bustier top. She accessorized with a thick black belt around her torso. Her Avengers cast mate Danai Gurira wore a fringed skirt and lingerie-inspired top. Rita Ora made a statement in a periwinkle blue dress with huge gold embellishments. Allison Janney was stunning in a white jumpsuit. Melissa McCarthy was beaming after winning the inaugural icon award. The Bella Twins — Nikki and Brie — were stunning in their bright, bold looks. Fellow WWE superstar Nia Jax looked stunning in a burgundy gown. Fun fact: She's The Rock's cousin! New talk show host Busy Philipps looked very cool in a big, black tulle skirt and matching turtleneck. Former gymnast Aly Raisman kept it short and sweet in a black and silver minidress. Terry Crews wore a white turtleneck under the blue suit. He perfectly matched his wife, Rebecca. The Real host Jeannie Mai looked very cool in gray pants. Comedian Lil Rey Howery looked awesome in his leafy green suit. Crazy Rich Asians star Harry Shum, Jr. was too cute with his wife Shelby Rabara, hours after they announced her pregnancy. Good Girls stars Christina Hendricks, Retta, and Mae Whitman wore some of the most interesting looks on the red carpet. Who were the best and worst dressed of the night? Sound off in the comments!